BROWNSVILLE — Cameron County Commissioners Court approved an order Thursday morning allowing County Judge Eddie Treviño Jr. to close Highway 4 and Boca Chica Beach during potential space flight activities. 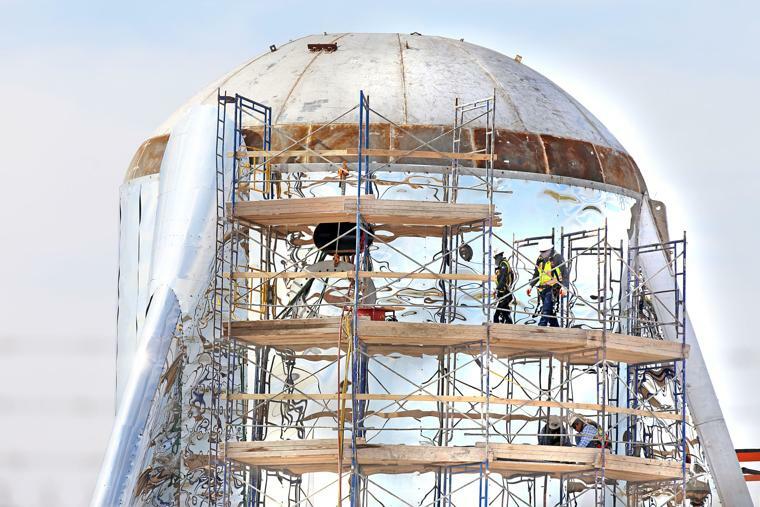 The move comes nearly a week after Boca Chica Village SpaceX watchers first saw the booster portion of the Starship Hopper prototype moved to the construction site at the facility to the launch pad. The order was approved after nearly 20 minutes of executive session where commissioners conferred with legal counsel regarding space flight activities. When that happens, Gleeson said a safety zone will be established. “SpaceX will establish a safety zone perimeter in coordination with local enforcement and signage will be in place to alert the community prior to the testing,” Gleeson said. Treviño said the county is on a learning curve as potential launches draw closer to becoming a reality. “It’s exciting and we know that we keep moving closer and closer to that first test or whatever they’re going to be doing, and we’re wishing them all the best of luck and we’re excited,” Treviño said. In another recent development, SpaceX founder Elon Musk confirmed on Twitter last week to his followers that a Raptor engine was moved to Boca Chica Beach and was scheduled to be mounted on the Starship Hopper prototype this week. In 2013, former Texas Governor Rick Perry signed a bill granting Cameron County the authority to close beaches and access points to beaches for space flight activities. “A person planning to conduct a launch in a county to which this section applies must submit to the commissioners court proposed primary and backup launch dates for the launch,” the bill states. The legislation applies to any county bordering the Gulf of Mexico that has a launch site approved by the Federal Aviation Administration. However, when news of the county’s approval broke Thursday morning, Keith Reynolds, who lives four miles from SpaceX, contacted the newspaper to share an email he sent to Treviño and Cameron County Precinct 1 Commissioner Sofia C. Benavides about his concerns over closures. Those documents show that SpaceX is required to notify Cameron County Commissioners Court approximately two weeks in advance of a proposed date for a launch or a static test fire, which SpaceX confirmed will happen in the near future. The FAA documentation also states that approximately three to six days before a launch operation that would require a closure, SpaceX must notify the public through local media, along with informing the cities of Brownsville and South Padre Island, as well as several state and federal agencies.